A few weeks ago I asked what content you wanted to see from me in 2019 on here, and on Instagram. I had so many suggestions so I’ve been busy planning out how and when I can create them. 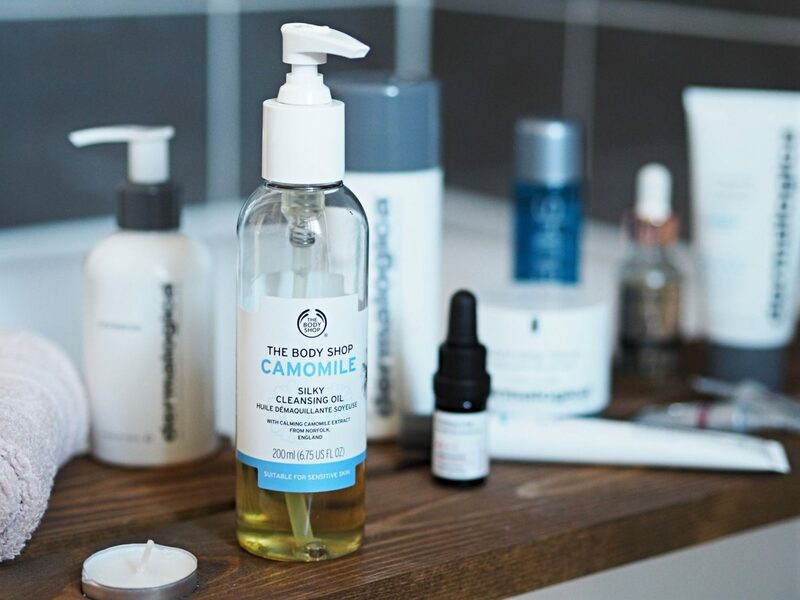 One of the requested posts was on my current skincare routine so I’ve listened, and here we are…..
I’m frequently changing what I use on my skin, however quite a few of these products below are ones that I continually repurchase as they are so good. 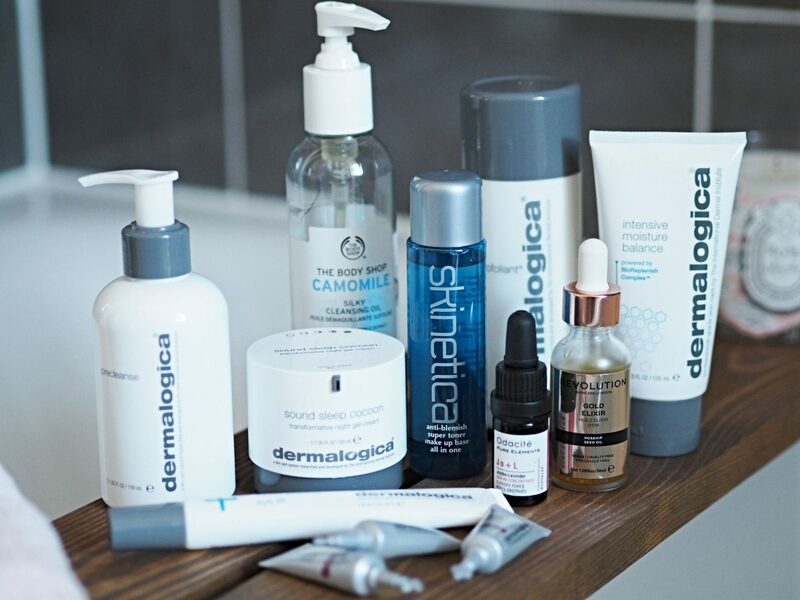 Dermalogica features heavily in this post and that’s because I’ve been a long standing fan of their skincare range – way before my blogging days. I’ve recently gone back to using their products and I’m so glad I did as my skin was starting to play up again with breakouts, but once I started using their products my skin goes back to the best version it can. So this is a list of what I’m currently using and more importantly…..what is working for me. As someone who wears a lot of makeup I always do a 2 step cleansing routine as one cleanse is just never enough when you wear the amount of foundation I do! 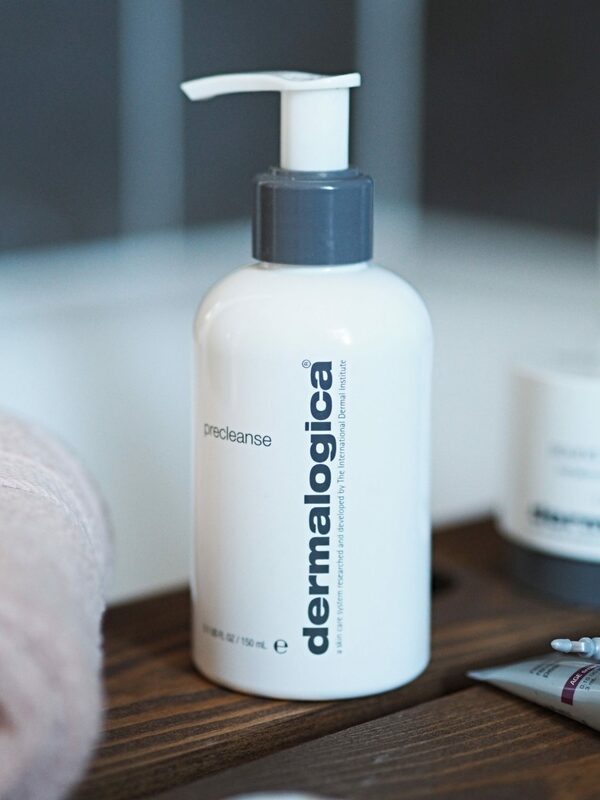 The Dermalogica Precleanse is an oil cleanser which is brilliant at breaking down makeup. It glides onto my skin and literally melts the makeup away. I then use a damp cotton wool pad to wipe it all off before my next cleanse. Put those makeup wipes down and get on the Precleanse bandwagon! You can buy the Dermalogica Precleanse here (Gifted). Even as an oily skin sufferer I’m still a big fan of oil cleansers and I’ve used the Body Shop Camomile Silky Cleansing Oil for a few years, and I always buy it when The Body Shop have a sale on. This silky oil cleanser leaves my skin feeling soft, hydrated and clean with no nasty residue. What more can you ask for? You can buy the Body Shop Camomile Silky Cleansing Oil here. I’ve talked about Skinetica on my blog before but it’s still not a widely known about product. Skinetic is a toner that is made primarily for acne sufferers. Now although I don’t have acne I have suffered a lot with blemishes and spots – even though I’m well into my 30’s. This is where Skinetica comes in. 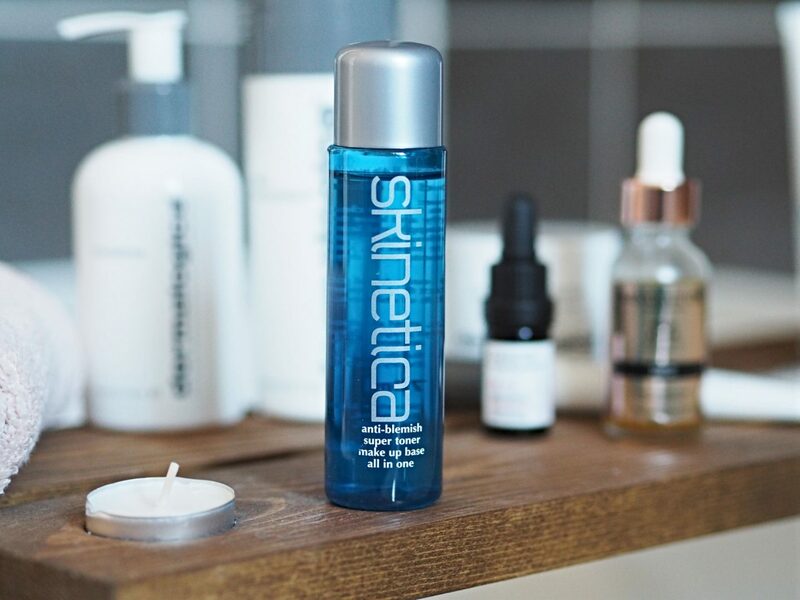 Honestly, if there are two things which transformed my spot ridden skin it’s ensuring I do a full cleanse, tone and moisturise twice a day, and using Skinetica. If one or the other slips then the huge volcanoes start to erupt! Skinetica contains highly purified water, ethyl alcohol and the active ingredient which is a new and unique type of organosilane quaternary ammonium compound (don’t ask me to pronounce that! ), which has been developed and patented by one of the leading physicists in the USA. Skinetica is safe for women in pregnancy, all skin types and sensitive skin (which I have). You can buy Skinetica here (while you’re on their site check out their testimonials). 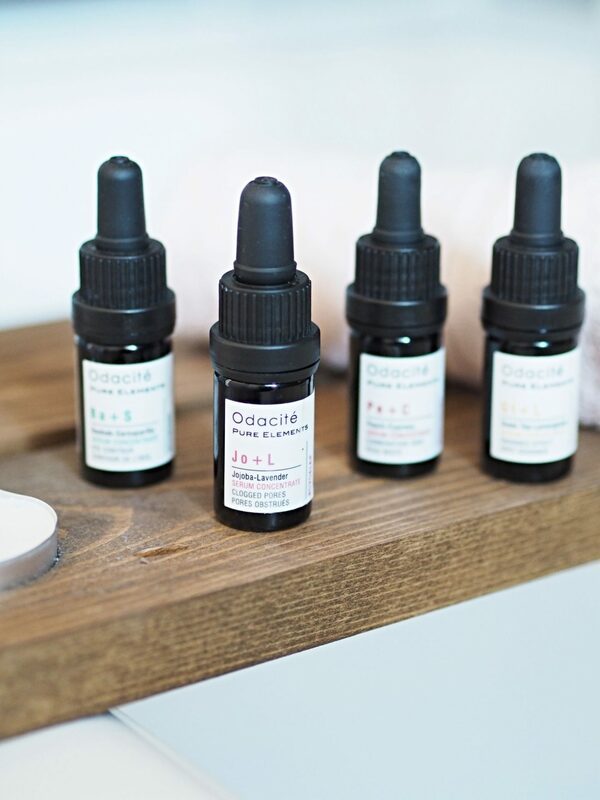 I’ve tried a lot off the Odacite range and their Clogged Pores serum is definitely my favourite. I use this either under or mixed in with my moisturiser in the day time – just depending how my skin feels that day. I love the ethos behind the Odacite brand – they only use organic ingredients of the highest quality and never test on animals. Big tick. Their founder; Valerie Grandury started Odacite after developing breast Cancer and decided to totally overhaul her health and lifestyle – which included looking at everything she was putting inside her body and onto her skin. The Odacite Clogged Pores serum has more of an oil consistency than a serum but a little goes a long way. It works by binding to sebum blockages and skin impurities to help prevent future breakouts. The serum has been formulated with jojoba to decongest and minimise the appearance of pores, in addition to balancing sebum production. I haven’t noticed any difference in the size of my pores but my breakouts were reduced when using it. It also includes lavender, which is has antibacterial properties to help reduce clogged pores. You can buy the Odacite Clogged Pores Serum here (Gifted). Oooh I do love a good facial oil and this one has specks of gold in it to make me feel extra bouji. 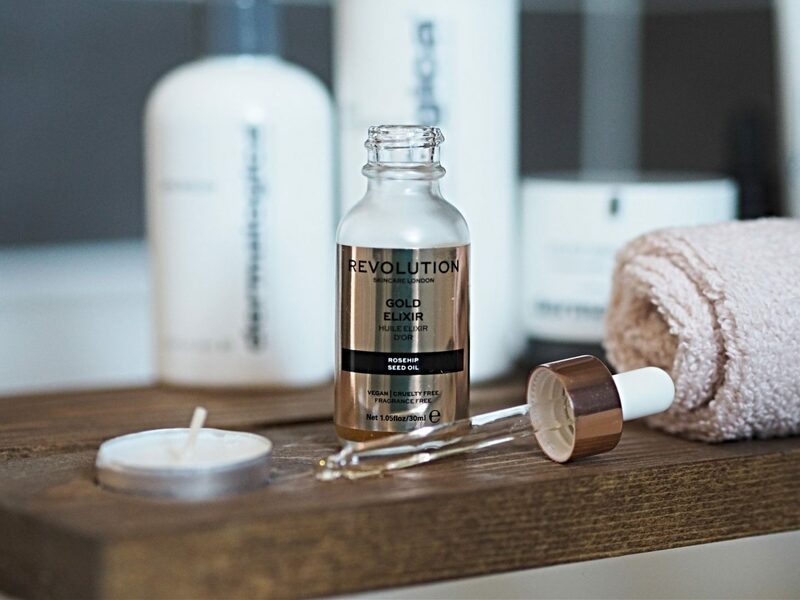 I use the Revolution Gold Elixir oil in the evenings under my moisturiser to give more that boost of hydration while I sleep. It’s full of essential fatty acids, which help to smooth away dry skin and give skin a healthy appearance. What’s even better is that this oil only costs £10! I love that brands like The Ordinary and now Revolution are producing quality skincare at the fraction of the cost of so many other brands. You can buy the Revolution Gold Elixir here (Gifted). Another product I’ve used for the years. 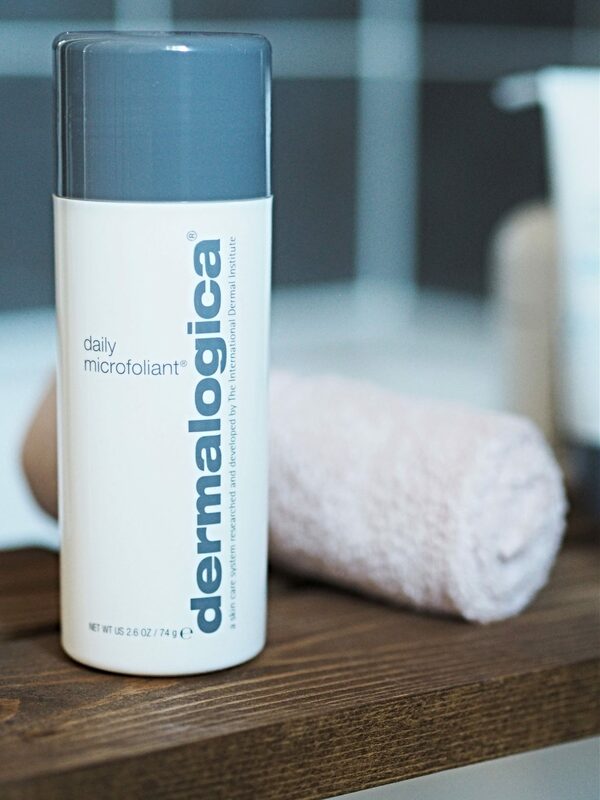 The Dermalogica Daily Microfoliant is a powder that you mix with water to create a gritty paste to exfoliate your skin with. Unlike a lot of exfoliators it can be used on even the most sensitive skin and is so gentle you can use it everyday – although I probably do it twice a week. Despite how gentle it is on the skin you can feel the difference immediately. My skin feels soft and silky, all with no irritation. You can buy the Dermalogica Daily Microfoliant here (Gifted). The Dermalogica Intensive Moisture Balance is probably my favorite day time moisturiser that I have ever used. Can I just leave it at that. Enough said. 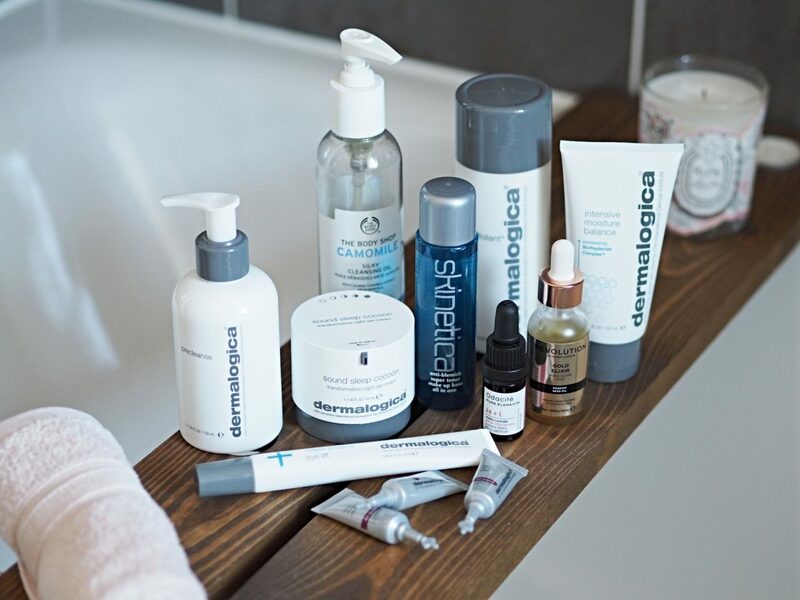 Ok, ok. I’ll give you a bit more info…..
I’ve tried quite a few (maybe even almost all) of the Dermalogica moisturisers and I find that the Intensive Moisture Balance is definitely the most hydrating. It’s so so so soft and silky that it’s a joy to put on and with only a very light (non-offensive) scent. 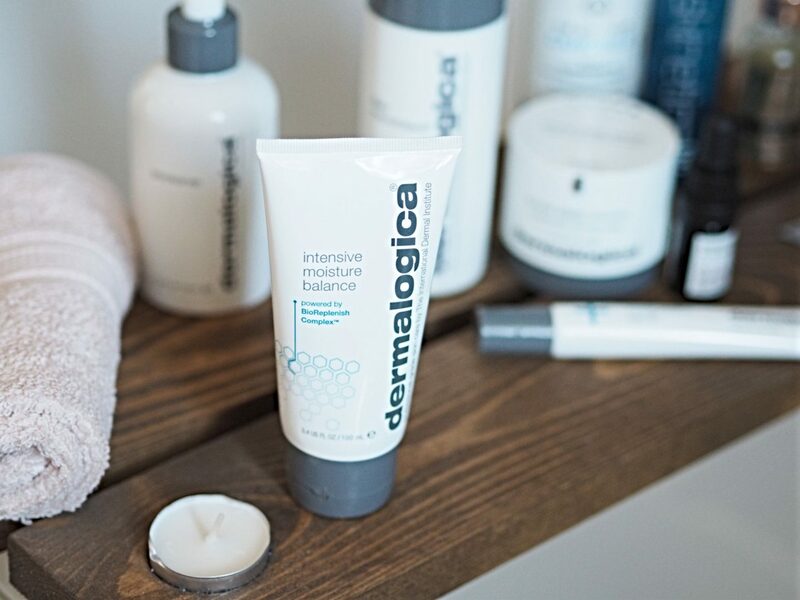 Dermalogica have just revived the Intensive Moisture Balance so this is a new formula which I love equally as much as the old one….. Intensive Moisture Balance helps restore the lipid balance to dry skin and is clinically proven to deliver nourishment 10 layers deep! It contains Hyaluronic Acid, combined with Echinacea, Centella Asiatica and Aloe Vera which lock in hydration to help boost the skin’s moisture content and reduce the appearance of fine lines. You can buy the Dermalogica Intensive Moisture balance here (Gifted). 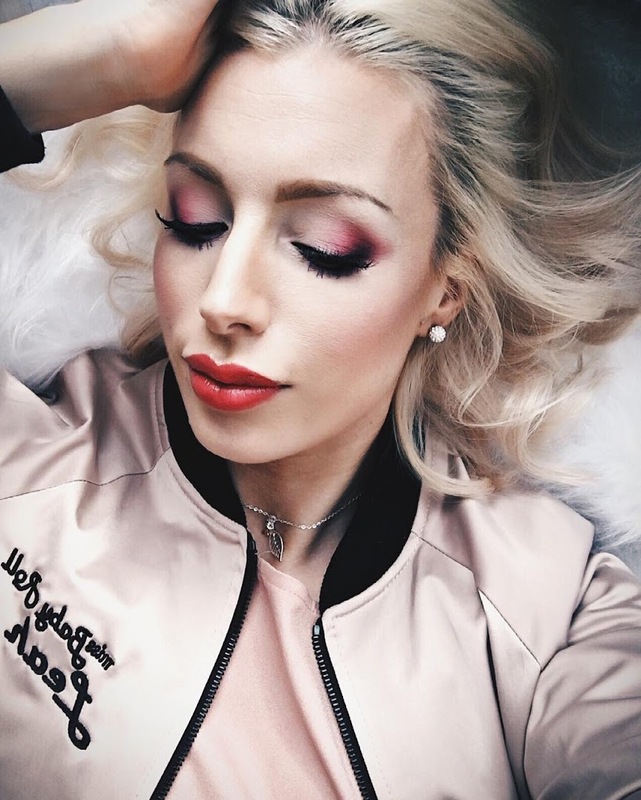 The Dermalogica Sleep Cocoon is a fairly new addition to my skincare routine and to be honest it wasn’t an item I thought I’d enjoy that much, but boy was I wrong….. The Dermalogica Sleep Cocoon is a light gel-cream so I didn’t think it would be hydrating enough for me skin, but that’s where I was wrong. As light as it is in texture it still hydrates my skin. But that isn’t where the wonders of this cream ends…..
It’s key ingredients include Silk Tree Extract which reduces signs of skin fatigue and restores vitality, while Wu-Zhu-Yu Extract provides visibly radiant skin by the morning. Ah-maze-zing! I love it! On top of that, this non-greasy moisturiser includes French Lavender Essential Oil (with Sandalwood and Patchouli) which works all night to promote deep, restful sleep. Now I can’t say I’ve noticed that this cream helps me sleep any better but I can definitely see the difference in my skin tone which is why it’s staying out in my routine. 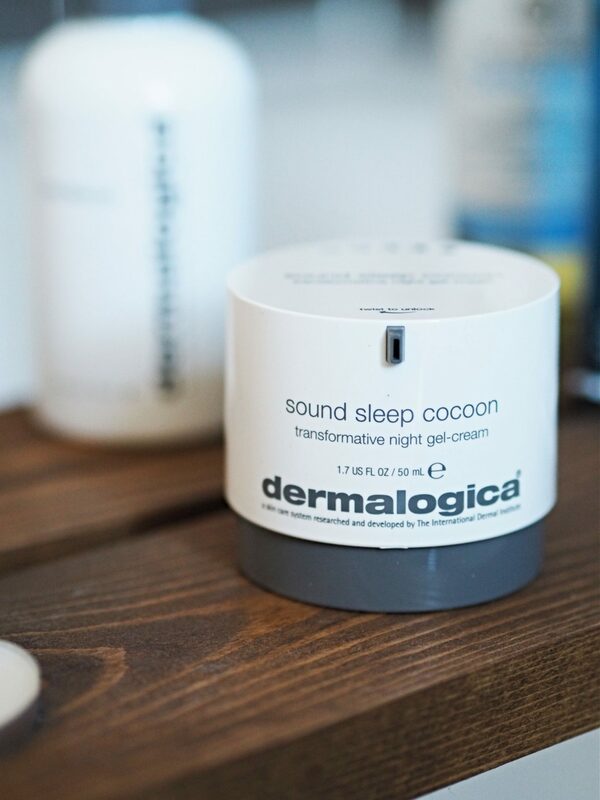 You can buy the Dermalogica Sleep Cocoon here (Gifted). 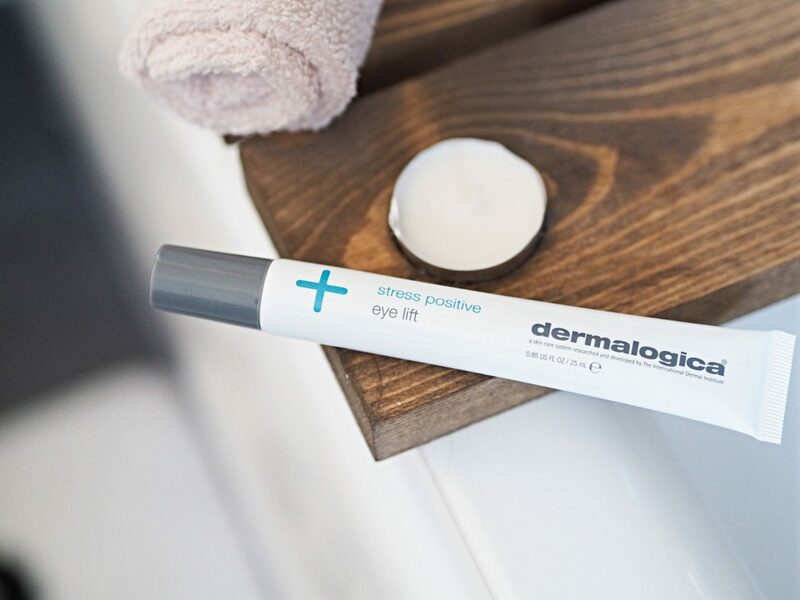 The Stress Positive Eye Lift is a new release for Dermalogica and I don’t often say this but I loved this from the first application. During December in particular I was not looking after my skin – late nights, lack of water/ sleep and drinking nearly every day took its toll especially in my eye area. My eyes looked tired, hollow and were a grey/ purple colour and I hated it. From the first time I used it I could see a difference in the colour of my skin under my eyes. I’ve never seen that with any other eye treatment which is why this baby is staying in my routine! You Can buy the Dermalogica Stress Positive Eye Life here (Gifted). 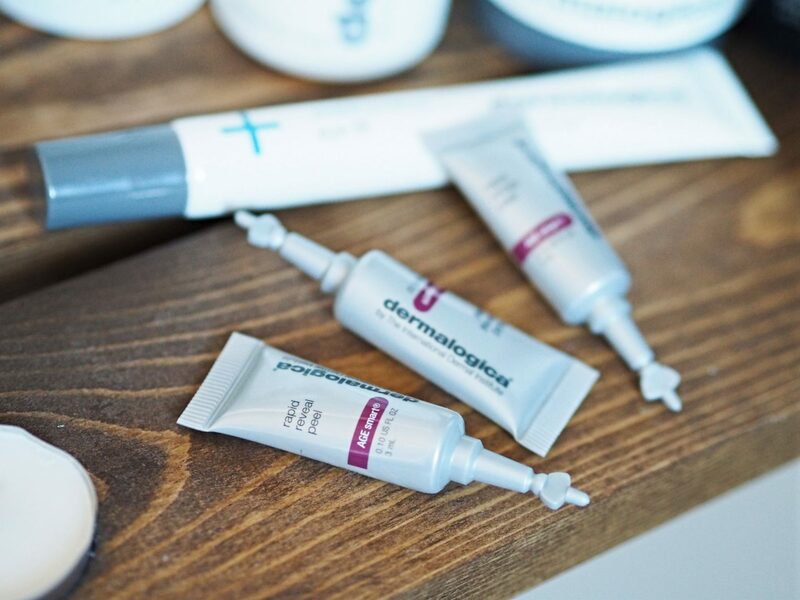 I’ve always wanted to have a professional facial peel done but have never got round to it so when I got to the try the Dermalogica Rapid Reveal Peel last year, which is an at-home peel treatment I was very excited. This is Dermalogica’s maximum-strength exfoliant with no downtime – I feel very mild stinging which goes after about 30 seconds (and I have sensitive skin). AHA extracts, Lactic Acid and fermented plant enzymes help produce firmer skin, reducing the appearance of fine lines and wrinkles by removing dulling surface debris without causing dehydration. I use this treatment weekly and I notice a difference in my skin texture and complexion every time I use it – I love it! Now, this product is pricey at £79 a pop, but when you think that it provides 10 treatments and you can easily pay £70 – £150 for ONE peel in a salon I don’t think that price point is bad at all. You can buy the Dermalogica Rapid Reveal Peel here (Gifted). I hope you’ve enjoyed finding out about my current skincare routine. Are there any products you would recommend? This post contains PR samples/ gifted items but I have been under no obligation to post about them. Please see my disclaimer here. Previous Post A Frank Chat About Being 36 And Single….